Yesterday was a frustrating sort of day. Although it started well – sun, slightly better waves, some west, an albatross… mid afternoon saw a wave crash right over the boat and snap the spoon of one of my two remaining oars in half. Not good. I spent yesterday getting getting together advice, ideas and equipment, and this morning attempting repairs. Ideally I would have been doing this somewhere where I could have kept the surface of the blade clean and dry, but instead I had to make do with trying to shelter it with my body every time a wave crashed over. I've gone for the simple repair to start with, and will see how it holds over the coming days (seems to work ok so far). Stronger, more complicated repair lined up as an option, but only if this one doesn't work. 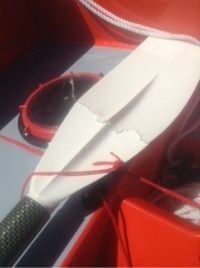 It's annoying to still have most of the way to go with broken oars, but hopefully it won't slow me up too much. With my rowing cut short yesterday evening, I spent some time on blister care. My hands are actually looking surprising well (thanks mainly to my lovely Kakadu gloves), but I had a couple of blisters that were getting painful and full of pus. I lanced them and then sprayed them with my iodine dry spray, before going to sleep. It worked wonders and they are feeling great today!